Leicestershire won their first County Championship game in almost three years as they beat Essex by six wickets. 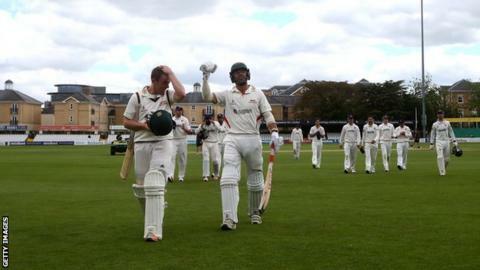 The Foxes, whose last victory was against Gloucestershire in September 2012, were on a 37-game winless run. Resuming on 55-0 and needing 108 more runs, Leicestershire lost four quick wickets, including first-innings centurion Angus Robson for 71. But Andrea Agathangelou struck an unbeaten 42 off 41 balls to see the visitors to their target of 163. The victory ended a tumultuous couple of seasons for Leicestershire which saw them finish bottom of Division Two in 2013 and 2014 without a single win in either campaign. They were the first team to go without winning in back to back seasons since Northamptonshire suffered that fate before the start of World War Two - although Northants went 99 matches without a victory from 1935 to 1939. The club's struggles saw them lose a number of their best players at the end of last season including Shiv Thakor, Nathan Buck and Josh Cobb - while captain Ramnaresh Sarwan also left Grace Road in the middle of 2014. Despite appointing Australian Mark Cosgrove as skipper for the 2015 season, Leicestershire still found themselves without a win in five matches this campaign and bottom of the table. However, after dominating the opening three days at Chelmsford, the Foxes went into day four knowing only a major batting collapse would deny them victory. Robson and Matthew Boyce batted calmly early on as they moved the score along to 87-0, but when Boyce edged Jesse Ryder to first slip it triggered the start of a difficult half-hour for the batsmen. James Porter bowled Ned Eckersley and Cosgrove in consecutive overs and when Robson edged the seamer behind, Leicestershire were in slight trouble at 117-4, still needing 47 runs. But former Lancashire batsman Agathangelou took the attack to the bowlers, striking seven boundaries in his innings, and found an able partner in Leicester-born Lewis Hill who struck a six in the final over and then a single to see Leicestershire over the long-awaited winning line. "It's a very big day for the club that's for sure, it's been a few long years I suppose without a win and hopefully we can move forward on to bigger and better things. "We've got a lot of new players at the club now and a new fresh feel about the place this year so hopefully we can continue on but certainly a very excited dressing room today. "We've been a much improved team already this season, despite not winning the opening games, we've been there or there abouts. "There's a good feel about the place now and I think the club's in a good place." "It's a great feeling for all of us because we've had some dark days in the last couple of years. "I was a bit nervous going in after we'd lost a couple of wickets but tried to concentrate on my batting and Andrea (Agathangelou) was great at the other end. "I wasn't sure at first whether that last one was going past cover, and I ended up coming back for a second (run) even though we didn't need it - I've already had some stick from the lads for that. "We had a good sing in the dressing room but this won't be it for us now - we want to start climbing up that table, and thinking about promotion like we said before the start of the season."